On the occasion of its twentieth anniversary, the Fondation Beyeler in Riehen (Basel, Switzerland) is presenting one of the most important artists in its collection: Claude Monet (1840-1926). 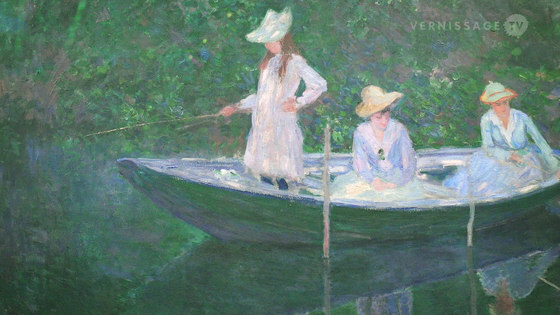 The exhibition brings together sixty-three masterpieces from private collections and renowned museums such as the Musée d'Orsay in Paris, the Pola Museum in Japan, the Metropolitan Museum in New York, and the Art Institute in Chicago. The featured works span Monet's artistic development from Impressionism to his famous late work. In his paintings, Claude Monet experimented with the changing play of light and colors in the course of the day and the seasons. The show presents his Mediterranean landscapes, wild Atlantic coastal scenes, different stretches of the Seine, meadows with wild flowers, haystacks, water lilies, cathedrals, and bridges shrouded in fog. 15 paintings from various private collections that are seen extremely rarely are special highlights of the show. This video provides you with an exhibition walk-through during the opening reception of the exhibition on January 21, 2017. Claude Monet: En Norvégienne (1887).